Doodlebug Cream & Sugar Paper 12x12 Love You Lots (25 piece) by DOODLEBUG at Designers Artists. MPN: CAS12X-5494. Hurry! Limited time offer. Offer valid only while supplies last. 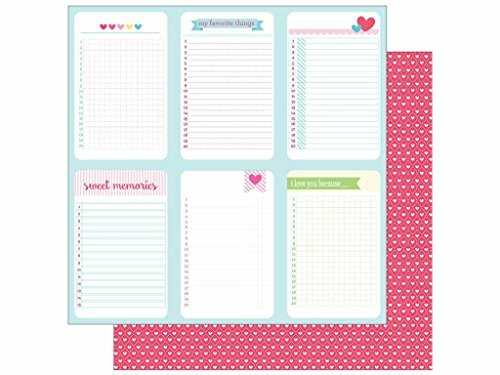 Doodlebug Collection Cream & Sugar Paper 12''x 12'' Love You Lots- Double sided cardstock, one side has sections you can cut apart or leave as is. Doodlebug Collection Cream & Sugar Paper 12"x 12" Love You Lots- Double sided cardstock, one side has sections you can cut apart or leave as is. There are places to write. Colors are blue, pink, yellow, green, and white. The reverse side is pink with rows of mini white hearts, with mini dots surrounding each heart. If you have any questions about this product by DOODLEBUG, contact us by completing and submitting the form below. If you are looking for a specif part number, please include it with your message.